A little sushi this morning? I am a fussy sushi eater. I may be alone among the millions who LOVE sushi. I like California Rolls but I don't like fishy sushi. I do however, like sushi stamps. Sushi is fun to colour. So I coloured this Paper Smooches Let's Roll Sushi to submit to this week's Paper Smooches Spark's Challenge and for Kathy Racoosin's 30 Day Colouring Challenge! what a fun sushi card.. Absolutely PERFECT sentiment for this! LOVE it!!! Very cute card with the sushi! Wonderful coloring and love the fun sentiment! You're not alone with the fishy sushi! My husband loves all sushi and I like it as well, but only when it doesn't taste "fishy". I just love this card and now I think I may have to get this stamp set just so I can make some fun cards for my husband! Tracey, great coloring on your sushi. Cute card. I'm not big on sushi unless it's cooked. Anyway, your daughter must have reached her destination safely. I'm sure she will have a great time. I love the CA roll too and this card! How are you doing with you alone time? Love your CAS design!! & that sushi is adorable! 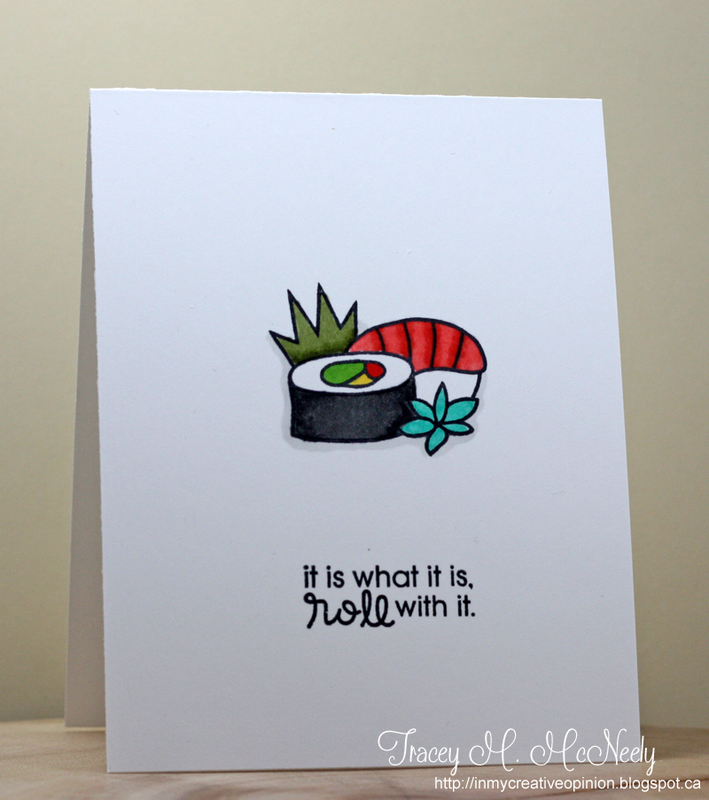 I'm with you on the sushi, Tracey, but I love how you've made it one your card. 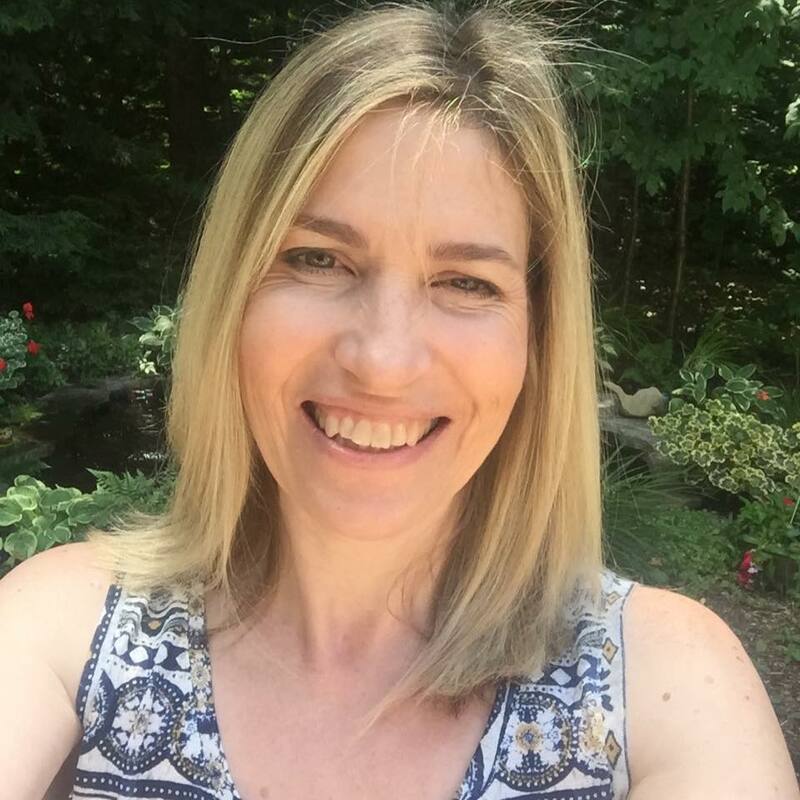 This is so cute Tracey! I have loved that sushi stamp from the first time I saw it! Great coloring! This card is PUNderful! hehe. You always know just what to do to make a CAS creation perfect. I'm jealous. As for sushi, I only like the tempura kind. Nothing raw and wriggling for this girl. Nope, no sushi for me!! But a cute sushi card I can handle!! Cute sushi! This is about the only way I like it, stamped and colored! This is adorable. 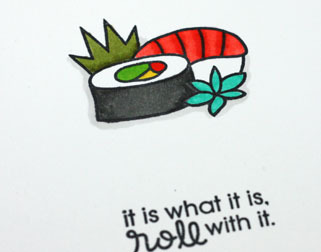 And, also the only way I like sushi--on a card. Really beautiful coloring on the Sushi...love the colors and as always, your design is fabulous, Tracey! Love the sentiment, too! this is fun and so true! Just too darn cute and I have to agree with Joyce, sushi is best on a card. this is so cute, Tracey! thanks so much for playing along with us this week at Paper Smooches SPARKS!